A view of Obanliku in Cross River State. 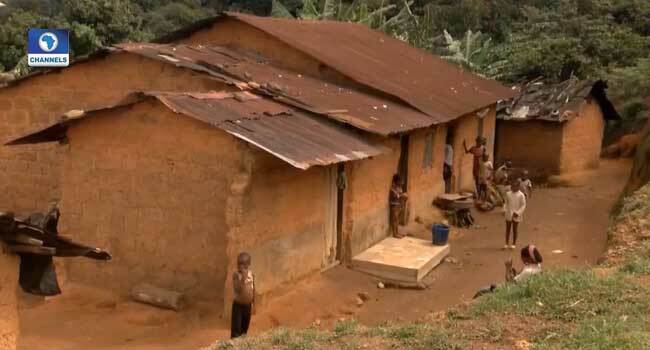 The Becheve tribe of Obanliku Cross River State comes under the spotlight for a culture which subjects young girls into modern slavery through a tradition called ‘Money Marriage’. Obanliku, a local government situated in North region of Cross River is an eight hours drive from Calabar the State Capital. 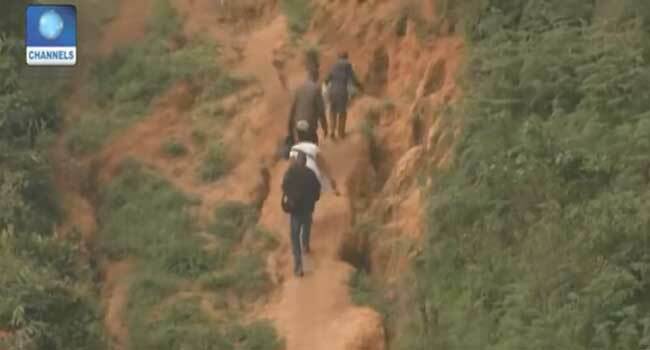 Visitors climbing into Obanliku Community. Richards Akonam, a missionary who has spent over 25 years building a strong advocacy against the Money Marriage culture, told Channels Television that relatives of the ‘Money Woman’ freely visit the couple after the ‘marriage’ and enjoys gifts including money. 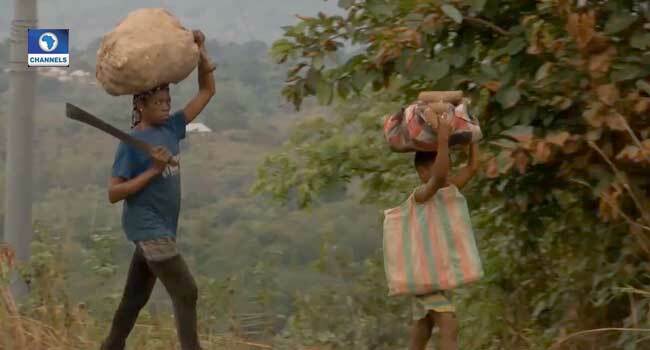 “While her parents or relatives share money and other gifts given them by the ‘groom’, she is left alone to struggle and find a means of survival. “The child is given to a man who pays a certain amount of money. It can be before the child is born. If it is a girl-child, the child is given to the person (groom) after he has made payment that is required by culture,” he said. Most of the girls could hardly express their story as all they could do was cry when being interviewed. Aji Patience whose sister was sold at a tender age of four expressed disapproval at the tradition. “My Sister was four years old when they gave her out for money marriage N2, 000 as at then was given to my uncle in exchange for her. I don’t like the condition,” Patience said. The story, however, gets complicated when the husband dies. When the husband dies, his next-of-kin marries the girl and if she dies without giving birth to children, her parents are obligated to bring a replacement as demanded by the customs. Another victim, Victoria Tabang, who spoke in the local dialect said she has remained helpless since her husband’s death. “I lived with him since I was young but upon his death, I couldn’t do anything. I’m expected to just remain here. Even when I went to my people, they drove me away, saying I now belong elsewhere,” she said. ‘Money Wives’ are not allowed the right to education and in every sale; the girl’s opinion is not sought. She is the breadwinner. Victims of this marriage are sold for as low as N10,000 few goats and pigs, tubers of yam, depending on the man’s bargain power. ‘Money Wives’ are not allowed the right to education and in every sale, the girl’s opinion is not sought. “Money that the man give in my head (sic) was not much. 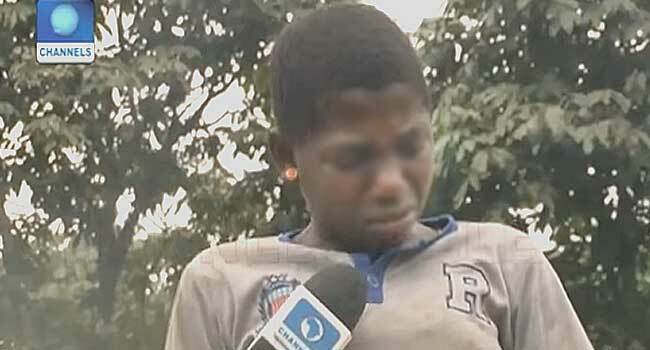 It was N20,000 and one goat,” a victim who was willing to speak, sadly revealed. A mother and her daughter returns from the farm in Obanliku community. Once a girl is sold out for Money Marriage, she is considered dead by her immediate family and warned never to return back irrespective of how she is being treated by her husband or his relatives. The wife of the state governor, Linda Ayade, in an interview with Channels Television, said she is shocked by the practice. He assured that efforts will be geared towards ending the culture. The Money Marriage culture of the Obanliku is another clear case of human slavery in the 21st century which needs urgent attention of the government and advocacy group to end the miseries of the victims.